This week I’m offering you a downloadable resource for presenting the ECyD “10 Needs of Adolescents” to any audience, whether adults or teens themselves. The 10 Needs of Adolescents is a list that delineates into 10 items the existential needs of people during the period of adolescence. This presentation has successfully been used by several people already. How do I see teens? It’s important to avoid prejudices and the like in our interactions with teens. They really experience the world differently than adults, so it’s easy for an adult to misinterpret them. The purpose of this step is to renew and refresh how we look at and approach a teenager, and to do this before moving on to building positive relationships with them. How teens search for meaning. This step focuses on adolescence as a stage of development. It describes the three stages within adolescence: early, middle, and late. It helps us understand the guiding principles behind the stage in life called adolescence. Here we discover that teens are in search of their identity, purpose, and independence. Looking at the teen, what do we see? Once we discover what moves a person during adolescence, this step helps us understand the specific needs, wants, desires, questions adolescents are looking to fulfill. This is an important analysis if we as adult mentors are going to respond to their needs and relate to them fruitfully. 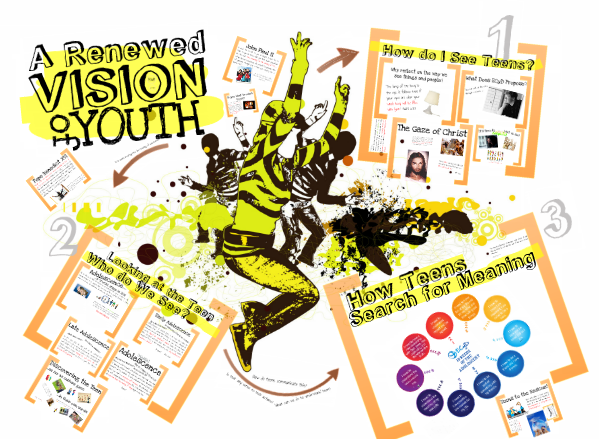 Posted in Adolescence & PedagogyTagged adolescence, ECyD, presentation, resource, showcase ideas, teens, youth ministryBookmark the permalink. you should consider adding a pin-it button for sharing! Thank you for sharing! I just added a Pin-It button. Thanks for the encouragement!